Deep fried meatballs seasoned with fresh herbs and spices always taste heavenly. This is yet another meatballs recipe combined with carrots and seasoned with cinnamon. Although I've used beef mince for the same, you can replace it with mutton or chicken mince. While making these meatballs, make sure you add carrot at the last moment else the base may get soggy if kept for long time. Use your favorite dip to nicely complement these spicy and lip smacking meatballs. If you don't prefer deep fried food, you can go ahead with the baked version which tastes equally good. 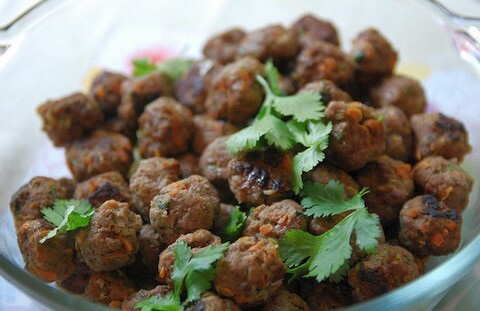 Leftovers of these meatballs can be included in your breakfast patties. Let's make these tasty meatballs in a few easy steps. Try these hot and fulfilling beef meatballs combined with freshly grated carrots and seasoned with moderate amount of cinnamon for a unique and pungent flavor. Apart from coriander sprigs and vegetable oil, mix all other ingredients in a large bowl with your hands. Make even sized meatballs from the seasoned mince base and keep on a lightly greased plate. Heat vegetable oil in a wide pan on a medium flame. Deep fry all the meatballs till they turn golden brown. Place on an absorbing sheet to remove excess oil. Garnish with coriander sprigs and serve hot with your preferred dip or sauce.